It is an initiative to bring in aspects of mass production and efficiencies of industrial processes in housing. The design is rooted in how people would love to live. A hub & spoke model combining mass production & local materials has been designed. About the Project: It is an initiaive to bring in aspects of mass production and efficiencies of industrial processes in housing. The design is rooted in how people would love to live. A hub & spoke model combining mass production & local materials has been designed. For the People: A home that is culturally suitable, socially acceptable, supports their livelihoods & traditional living pattern, pre-fitted with sanitation facility, fits in budget, comfortable in all weather, low maintenance & can grow in future with the family’s needs & capacity. For the Government: A clustered development of socially relevant housing solution which provides ample open space, in-built smokeless chullah, toilets, water harvesting possibility and can be solar powered. Design Process: Pan India ethnographic research; Extensive technological and construction industry research; Collaboration with civil engineers, energy engineers, humanities professionals, finance professionals, architects, industrial designers, etc. - Mass production combined with local material sourcing decreases cost & improves time efficiency. - Use of local materials leads to use of local skills. - A clustered development to house communities or families together. - The community has a shared common space and facilities. - Communities can be gated to form a secure space outside their homes in the shared space which can be used for keeping cattle, farm equipment, vehicles, etc. 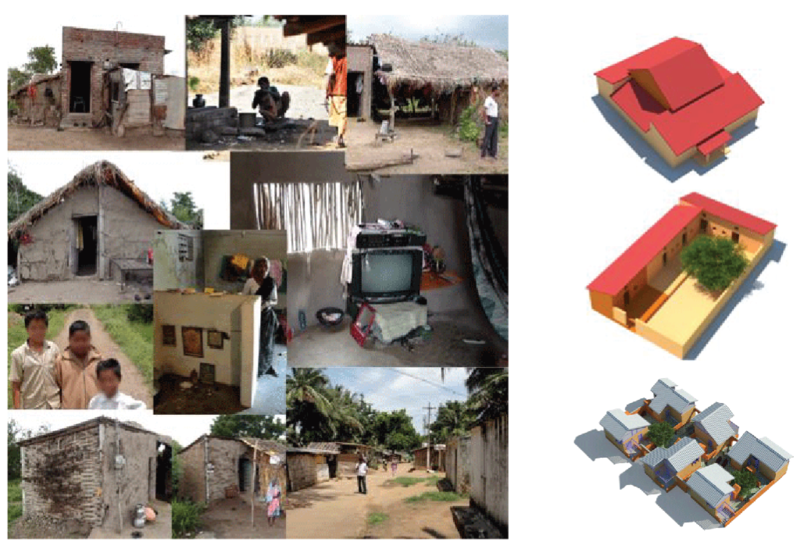 - Fluid spaces gives the beneficiary the opportunity to select his/ her house layout. - Choice of layout gives the beneficiary greater satisfaction. - Lean roof and vertical height aids vertical internal additions.